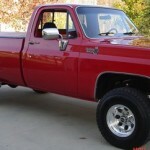 Mark from Ohio sent in his bright red 1975 Chevy C10 4×4 for our consumption. 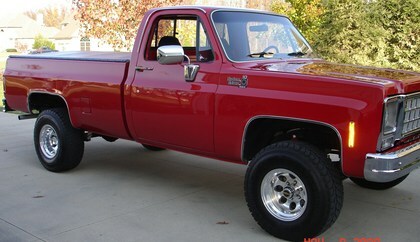 He says his truck not perfect, but runs and drives nice and looks great! 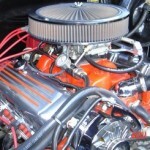 He did a partial restoration on the truck to get it in shape. 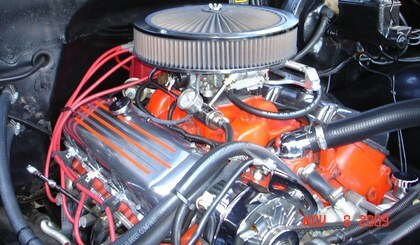 Under the lid is a 454 to provide plenty of torque. 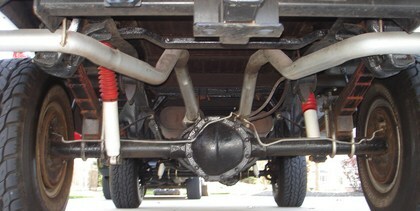 The 75 also includes lock-out hubs, power steering and all new brakes and lines. New tires and custom wheels were installed to brighten up the look. Inside the bed was Rhino-lined and a tonneau cover added for a smooth look. New interior with a CD & Ipod enabled stereo with amp and speakers for some thumpity-thump.